I recently met up with my former parole officer. He wanted my opinion on resistivity meters for checking real Au / Ag vs fake. (You can web search yourself by typing: -resistivity meter for coins-). What I immediately suggested to him is buy numismatic coins instead of bullion. Numis coins that have been slabbed by PCGS or NGC. The premiums on numis coins over bullion have, in general, never been lower. For example: A dealer I have used for decades, Liberty Coin Service in Lansing, MI, recently offered $5 Libs in MS-64 (PCGS) at $675 each, $669 if you purchased 4 or more. "In June 1989, with spot at $365, common date MS-64 Liberties were going for $7850." Looking thru LCS newsletters I see they were offering the same coin 2 years ago, JAN '15, at $719 each with spot at $1235. Over the years my favorite buys were low premium MS-63 Saints & MS-62 Libs. In many years the mintage is so great that the premiums are not much over spot. But, three years ago I got interested in the MS-65, $20 Liberty. A beautiful, high grade and relatively rare coin. These coins retailed for $4750 back in FEB '04 with spot at $410. Three years ago with spot around $1300 the MS-65, $20 Libs went under $3500. Now they are retailing around $3000. The coins I have discussed have great potential for appreciation beyond spot climbing: Spot goes higher, ok, everything goes up, but, as interest renews in the coin market these coins will also appreciate because of their rarity. And this brings me to the reason for purchasing slabbed coins...You don't need a resistivity meter or any other gadget to prove content. ​Slabbed is short hand for, "a coin grading, authentication, attribution, and encapsulation service" which was founded in 1985 by David Hall and associates which they named Professional Coin Grading Service. This opened the door for novice collectors. NGC was formed two years later. You can read more about grading services in our library article "A Rundown of the Different Coin Slabbing Services & Distinctions Among Them". What is Causing the Increase in Gold Bullion Demand? Adding a personal observation to the article linked at bottom re "Rundown of Slabbing Services." 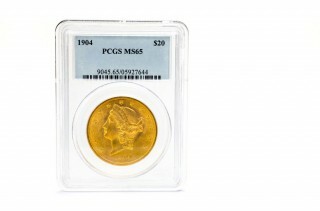 At any large coin show, for example Long Beach, you will see two kinds of slabbed coins...PCGS or NGC. In past few years PCGS seems to be preferred by collectors (as stated in the linked article). Have any other type (not PCGS or NGC) of graded coin checked carefully by someone knowledgeable. Better yet, have it reslabbed. Streber, you are correct. PCGS and NGC are the most trusted and most abundant slabbers by a long shot. ANACS and ICG are the only other two respected graders, but with very little market share, and their coins are likely to be scrutinized beyond their certification. They both also tend to over-grade and our experience shows that ANACS and ICG graded coins tend to be worth less than their PCGS and NGC counterparts. Without a doubt, to be on the safe side, PCGS and NGC are the way to go. Any certifications from graders other than the four mentioned can be considered basement slabbers and are not to be trusted. "...retailed for $4750 back in FEB '04 with spot at $410." Therefore, spot is 809 higher and the beautiful -65, $20 Libs are $1940 lower. First sentence below is best I have read this year. "The United States federal government is not a benevolent caretaker, but a leech that will use its citizens as a host to keep itself alive. As mainstream pundits and elected officials inevitably shift blame around like a twisted version of musical chairs, remember that self-reliance is the only solution. Those who become dependent on this crumbling house of cards are doomed to suffer the same fate as those seen waiting in lines for government handouts in places like Venezuela. Celebrate the $20 trillion dollar debt by breaking from the old system and exploring the new economy built on peer-to-peer networks, where individual skills are worth more than empty promises made by the State."